If you've ever wanted to start your own business helping and coaching people one-on-one or in groups, NLP is the quickest, most effective training you can receive today. If you have a burning desire to help people, to be your own boss, to set your own hours, and to be really proud of what you do, then Neuro-Linguistic Programming is for you. When you become an NLP Practitioner, it will not only allow you to help people professionally, you'll also be empowered to help your family, your friends and even yourself with one of the most powerful set of personal development tools ever invented. And the best part is, you can choose to either attend our Live Seven-Day NLP Practitioner Training, or get certified from home in our NLP Practitioner Distance Learning program with one-on-one assistance from an certified Trainer of NLP. We'll Send You Details AND a Bonus Training! When you request more info below, we'll send you details about these trainings as well as an invitation to a special bonus video training: Six-Figure NLP Success Secrets. Send Me More Info and the Bonus Training! "This is an actual NLP Practitioner Certification Training, in the traditional seven-day format, with full explanations and demonstrations, oversight by Certified Trainers of NLP, and personal interaction with your Trainer that meets and exceeds the standards for certification in the field of NLP for both hours and curriculum (Warning: four-day trainings do not meet these important international standards and are not recognized by others in the field). "When investing in an NLP training, you want to come to a reputable institute with a reputable training. The next Live Training is only 24 days away! Click here to enroll in this amazing training right now at the special "early-bird price" before it's sold out! Check the schedule for other upcoming dates and locations. "I was surprised at how easily NLP could be applied to produce rapid and deep changes. The home-study materials and pre-study materials are an excellent resource." "I learned more in one week than I felt I learned in 15 years in all the self-development courses I've taken!" "This was an incredible class! It was much more than I had expected. I feel comfortable putting the knowledge I've learned into action. This class also helped me to develop goals and define the steps necessary to reach them." "The instruction in NLP was absolutely invaluable to me in my profession and with my clients, as well as with my family and friends. The concepts I learned in this class apply to every aspect of my life." "The tools this class provides afford limitless opportunities for self-growth and caregiving. Gratitude is not a big enough response. Moving. Thank you both. XOXOXO"
"I really enjoyed this training. This is the first time where I've felt that the instructors actually cared about their students. The focus wasn't on just "text book" lecture, but interesting hands-on training and personal stories. I will definitely take additional trainings in the future." "I signed up for NLP Practitioner and couldn't wait for it to start. Fortunately, they included awesome pre-study material that I dove right into. I spent my afternoons with the prestudy materials on my shiny new iPod and Michael's hypnotic voice by the poolside, giddy as could be learning about anchoring, sub-modalities, and all the other Neuro-Linguistic Programming ideas. Little did everyone at the pool know I was learning things that would change my life forever... all while they were just getting a tan. Thanks again!" "This is the best "life training" I have ever received. Great for anyone who wants to live life to the fullest, being successful in every area of life." "I just wanted to let you know that I've just finished with my first paying hypnotherapy client (to quit smoking). It went very, very well. I've officially opened my doors as a hypnotherapist thanks to you!!!" "This is a life-changing experience. The connection you make with others in the group is amazing. I thank you so much. Plus, I do dislike ice cream now, due to the "like to dislike" NLP technique!" "It was the best class I ever attended! I think I learned more than I had expected!" Who's testimonial will be next? Maybe yours! Click here to enroll in this amazing training. Our graduates loved it, and they know you will, too! We'll teach you how to use all the NLP Practitioner level tools to use with others professionally as well as to use in your own life and with your family and friends. Unlike those "shortcut" four-day "Practitioner" trainings, you will learn and practice all of these techniques in class, so you will leave with a confidence in your proficiency through the hands-on the guidance of your Certified Trainer of NLP. T.I.M.E. Techniques™ is one of the most powerful set of NLP techniques. They are used to instantly eliminate all negative emotions, release limiting beliefs, undo past decisions, banish the effects of fears and phobias and completely eliminate the emotions of guilt and anxiety. Learn powerful techniques for communicating directly with the subconscious minds of others using the "conversational hypnosis" language patterns of Milton H. Erickson, one of the most gifted hypnotists who ever lived. EFT — sometimes referred to as Energy Tapping — is a revolutionary set of techniques created by NLP Master Practitioner Gary Craig. Designed to balance the energy system of the body, EFT removes the effects of negative emotions, physical pain and addictive cravings, such as those from cigarettes, alcohol and drugs. Learn how to coach yourself and others to success with the simple seven-step CORE Success Coach Method, created by Transform Destiny Founder, Michael Stevenson, and based on the principles of Neuro-Linguistic Programming and Coaching. Coaching is one of the leading new professions and offers many personal rewards in the form of personal fulfillment and residual income. This training is fully accredited and meets the standards for certification in the industry, including those of the International Board of Coaches and Practitioners, the International Hypnosis Federation, and other boards, so your certifications have world-wide recognition. Ours are the best trainings in the industry because we do more! Our trainings don't just meet required standards like other NLP institutes do — they exceed them. We are 100% committed to your success. That means that we'll do what it takes to help and support you, both before you attend and after you have graduated the class. Our trainers are fully available to you before, during and after your training to help you create success with NLP. Start learning NLP right away! Overcome objections when people tell you "no"
All of this will be delivered digitally online except the live training. Images are illustrative only, so there's no need to wait for shipping. You get immediate access! Now you can learn in one of two ways: either in-person at one of our live events, or from home in our Distance Learning Certification Program, assisted one-on-one by a Certified Trainer of Neuro-Linguistic Programming. Each program has exactly the same elements: pre-study, main seven-day training, bonuses, and support. The difference is that in the Distance Learning program, you will watch recorded videos of the live seven-day class. Instead of raising your hand in class, you'll ask questions directly to our team via text, chat, email, or phone. We're always here to support you. Instead of doing exercises in class, you'll do the exercises at home and record them using the video option on your smart phone or video camera. Once complete, send in your videos and test for evaluation and we'll send your completion certificates by mail when you have successfully completed the training. Simply make your choice below before proceeding to the shopping cart. Have questions? Just hit the live chat button in the lower-right corner. Every person in our office is a practicing, Certified Trainer of NLP, TIME Techniques and Hypnosis or a Master Practitioner. This means, when you call our office, you will not be given the runaround by "sales staff," as with other training companies. 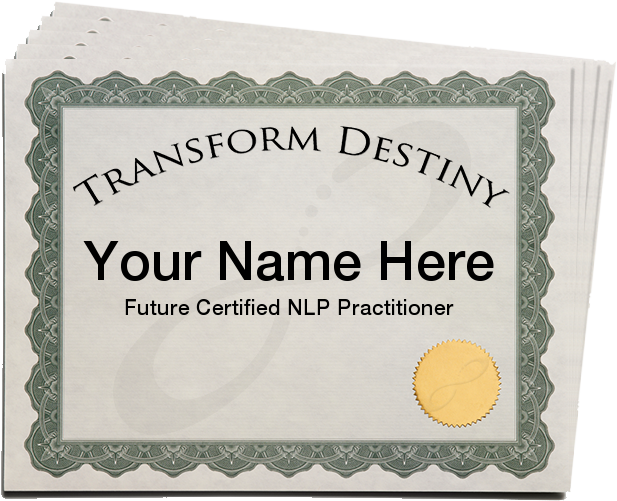 With Transform Destiny, you'll talk to a real NLP professional who can answer your questions, every time. No other NLP institute we know of can make this claim. This is why we offer world-class, unbeatable support. Stretch out your investment so you can benefit now and pay it back over time. As long as your payments are current, you can come to the training anytime, even before you finish your payments. Payments will be deducted automatically from your credit or debit card. It's easy to get started! Simply pick a date below, click the Add To Cart button and then choose the "Payment Plan" tab in the shopping cart! Our trainings qualify under US law for tax deductions. US Treasury regulation 1.1625 permits an income tax deduction for educational expenses including registration fees, tuition, travel, meals, and lodging for courses taken to improve or maintain skills required in employment or business. Many of our students write off their course investment including all travel expenses! Wouldn't it be nice to get a return on your tax filings for training in NLP? Consult with your tax professional for details about how to get this tax savings when you take our training. Attend This Training For Free! If you are a member of Michael's Inner Circle, you get this training for free! Click here for more info. Yes, Michael, I want to learn NLP, TIME Techniques, Hypnotherapy, EFT and Success/Life Coaching at the Practitioner level. I understand that this is a Limited Time Offer. Plus, I feel completely confident enrolling based on your reputation and the iron clad, money back guarantee. Sign me up now! Instant Access To These Bonuses and Pre-Study Courses!